With Mr. Bader Al Fardan and Mrs. Suad Al Habashi, Partners, Ezmeel – handmade. Starting from the signboard saying ‘EZMEEL – Handmade’ to the traditional wall hangings, everything at this cozy little outlet, at the Riyadat Mall, speaks of the concept with which the place has been set. The steaming cup of tea and the gratifying smiles of the owners welcomed Bahrain This Week team to the warm interiors of the shop. For us, along with being an escapade from the chill winter winds, it was the beginning of a journey from the world of readymade furniture to that of a customized and exclusive handmade home decor. The Husband – Wife interior designer duo at Ezmeel is giving new reason to decorate your world through their unique patterns, where the traditions meet the contemporary styles. Mr. Bader Al Fardan and Mrs. Suad Al Habashi shared with us their tale of the Phoenix and the journey together as one of the renowned interior designer duo in the Kingdom. “It is an inspiration for us to move forward and do what we do the best.” adds Suad. The duo has done interior design jobs for places including restaurants, villas, malls, outlets, office accessories and personalized gift items. “At Ezmeel, we guarantee that every piece of décor you buy from us are exclusively handmade designs completed just for you and won’t be replicated for another person by us.” Suad commented. “But the end product is highly unique piece that can add to the beauty and elegance to the area it’s placed.” Bader noted with a smile. This designer couple likes to work close with their customers, right from the first time they step into Ezmeel. “We work with them on every bit of their journey for making their home come live. Choosing the right kind of wood to the fabrics to be used; we are there to help them.” Bader said. The duo also had great praise for the craftsmen who worked at their workshop. “We are really happy with the team we have. They understand every bit of pattern and designs we assign to them and give their best every time. 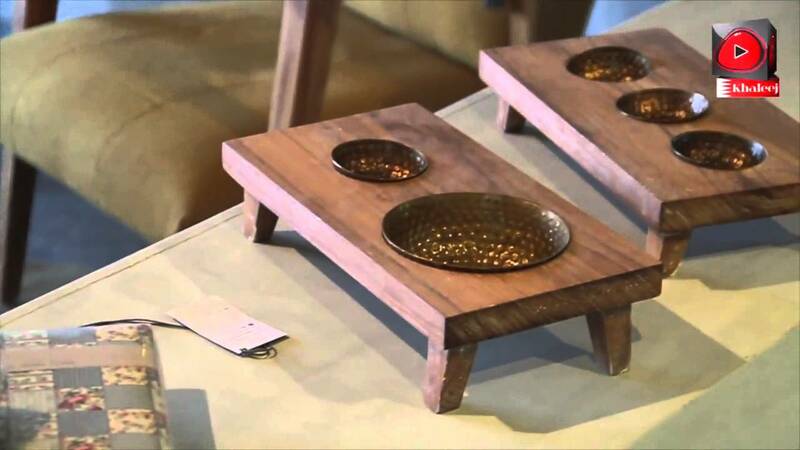 We have to admit that it’s our team effort that helps deliver high quality, durable, handmade and exclusive home décor items every time and on time.” he shared his key to success. With Valentine’s Day and Mother’s Day round the corner, Ezmeel has many surprises planned in for their customers. “We have handmade personalized gift items for the upcoming festivities. If you would like your gift items to have the personal touch, you can come to us in advance. We are here to help you make your special person feel extra special.” And as the designer couple gave us a sneak peek into some of the designs that would make perfect gifts, we couldn’t help envy those valentines’ who would be lucky to own one of these special pieces this year.